Mumbai/New Delhi: In a shock move, Reserve Bank of India (RBI) governor Urjit Patel resigned on Monday. 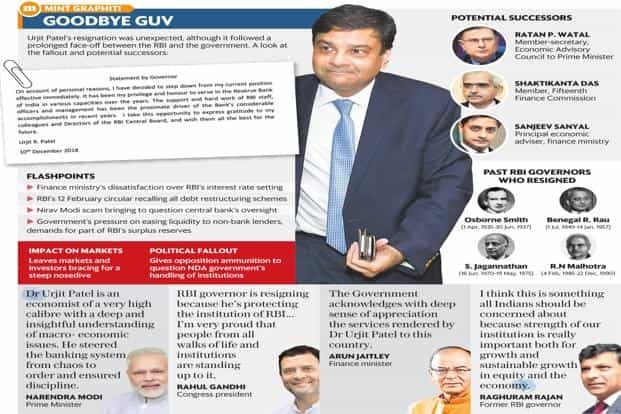 Officially, his resignation letter, all of 88 words, cited personal reasons for the abrupt exit; unofficially, it is apparent that Patel was a victim of the messy face-off between RBI and the government. Of immediate concern is the fallout of Patel’s departure, which came ahead of his tenure ending next September, on the financial markets, particularly with respect to the sentiments of foreign investors and rating agencies. They are likely to take a dim view of the resignation, given that the meltdown of some non banking financial companies (NBFCs) in the backdrop of an unprecedented bad loan crisis has cast a shadow of instability over the financial sector. The markets already took a nose dive on Monday as investors hedged their bets on the outcome of the poll results for five states due on Tuesday—especially since exit poll results signal that the incumbent Bharatiya Janata Party (BJP) is likely to lose in three key states. The big question is whether the markets should brace for a manic Tuesday. Urjit Patel’s resignation dominated the social media discourse and opened up a fresh line of attack for the opposition, which alleged that the BJP-led National Democratic Alliance (NDA) was systematically eroding institutions in the country. Very likely, the stormy discourse will find a new arena when Parliament convenes on Tuesday for the Winter Session. Prime Minister Narendra Modi and finance minister Arun Jaitley took to social media in a damage control effort by effusively praising Patel. In the backdrop of the acerbic fallout, those claims found few takers. Patel’s tersely worded statement, released after market hours, said: “On account of personal reasons, I have decided to step down from my current position effective immediately." However, clues available from interviews and social media posts of insiders confirm that the resignation was a result of the face-off with the government. Evidently, the normally reticent Urjit Patel had kept his cards close to the chest as even senior colleagues on the RBI board were unaware that the governor would make such a drastic move. To most he conveyed a sense of business as usual. On Sunday, Patel personally messaged a few eminent persons inviting them to attend the 16th L.K. Jha memorial lecture by professor Helene Rey, Lord Raj Bagri Professor of Economics at the London Business School, to be held on Friday at 5pm, just after the RBI board meeting. “It’s a big surprise. We don’t know what transpired between yesterday and today. I don’t know what happened in between. Even the RBI board agenda was circulated on Sunday," said a person familiar with the development. In the absence of any official word, speculation gained ground that the resignation was prompted by the composition of the monetary capital framework committee. However, a person familiar with the developments denied this claim. “If there was no agreement on either the nominee of the RBI or finance ministry, then a third person could have been chosen. India has a spectrum of experts," the person said. “There was nothing so surprising in the agenda (of the RBI board meeting) either. It was all routine items pending from the last meeting." The RBI and the government have been engaged in a bitter face-off for weeks over the central bank’s autonomy as the centre sought to limit curbs on lending and gain access to RBI reserves. The friction came to light when RBI deputy governor Viral Acharya warned that compromising the central bank’s independence could be “catastrophic". This was followed by Jaitley publicly accusing the central bank of sleeping on the job and for its failure to check indiscriminate lending by public sector banks between 2008 and 2014. Matters worsened after the government issued three letters to Patel, threatening to invoke Section 7 of the Reserve Bank of India Act, 1934. However, the tension was defused at a marathon board meeting last month when the warring sides found a middle ground on some of the contentious issues. RBI made concessions on the capital adequacy of banks, while the issues of transfer of surplus reserves and relaxing norms for weak banks were referred to committees. The central board advised RBI to let banks recast loans of up to ₹ 25 crore given to MSMEs (micro, small and medium enterprises). RBI watchers said disagreements between the central bank and the government were not new. However, they said, the change in the style of communication under Patel’s leadership was one of the reasons for the rift. 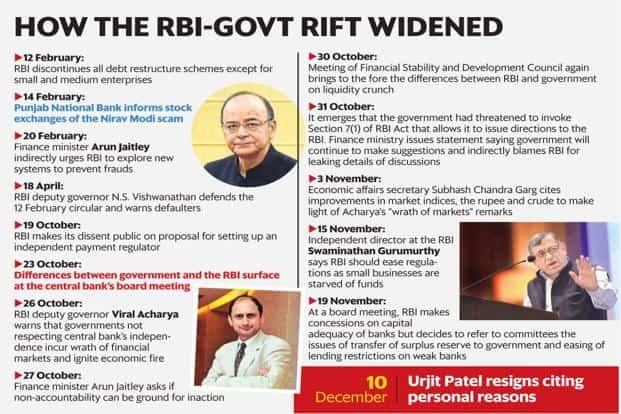 Under Patel, RBI had reduced its interactions with industry representatives, giving rise to a perception that it is not as approachable as before. Former RBI governor Raghuram Rajan told ET Now that Patel’s resignation should be a matter of concern for all Indians. “I think this is something all Indians should be concerned about because strength of our institution is really important, both for growth and sustainable growth in equity and the economy," he said. A central bank official said on condition of anonymity that following the induction of certain political nominees on the board, along with the government’s push to turn the board into the apex decision-making body, left Patel with little choice. “After all, the board cannot be expected to make unbiased and neutral decisions like the governor since, to a certain extent, some board members also represent external interests," the official said. Ratings agency Moody’s Investor Service said in a statement: “The independence of a central bank is an important consideration in our assessment of a sovereign’s institutional strength. We would consider signs that the government attempts to curtail the central bank’s independence to be credit negative. That said, our assessment of institutional strength ultimately focuses on the quality and policy outcomes of the institutions themselves, not on the individuals leading them."